In the context of the discussion, Deputy Lord Mayor Abiad raised the prospect of term-limits being applied to Councillors. This generated some discussion and debate within the media. The motion for the workshop was carried. I however voted against the motion on the basis that Council undertook a representation review quite recently and I do not consider now to be the most appropriate time to re-open this debate. I also do not support the idea of two-term limits being applied to Councillors and believe that the current make up of Council (a mix of experience and new perspectives) demonstrates that the status quo is working well. At the Economic and Community Development Committee on 17 February, Council administration proposed that 28 parking spaces be allowed on Pinky Flat for disability permit holders on Football match days to provide disability access for the Adelaide Oval. 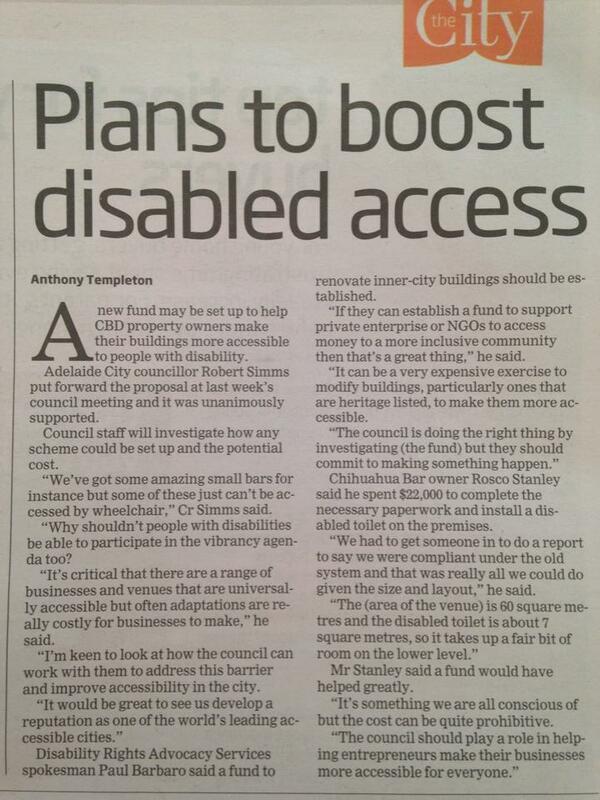 As reported in The Advertiser, the majority of Council did not support this recommendation. I did not support Councillor Corbel’s motion to exclude the reference to Pinky Flats from the disability parking proposal. This was a very difficult decision for me as I am opposed to general parking on the Parklands and am passionate about resisting encroachment on this space. However, given the circumstances presented to the Committee, I believe an exception was warranted in this instance. 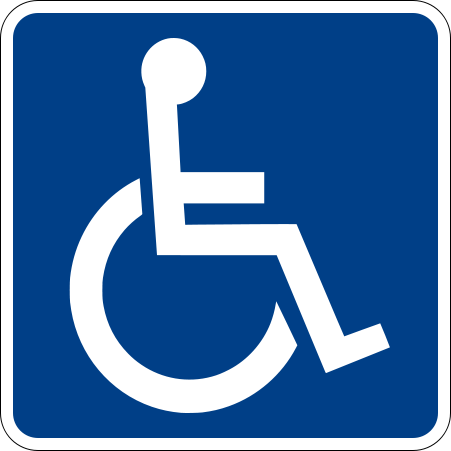 Indeed, in my opinion, we have a responsibility to provide disability access and it appears that this is the only available solution at this time. Of course, a better option would be for disability parking to be provided under the oval or onto the north-side. The responsibility for this lies with the SAMA. I do hope that we can find a solution for disability parking for major events such as this. A rainbow crossing for Adelaide? 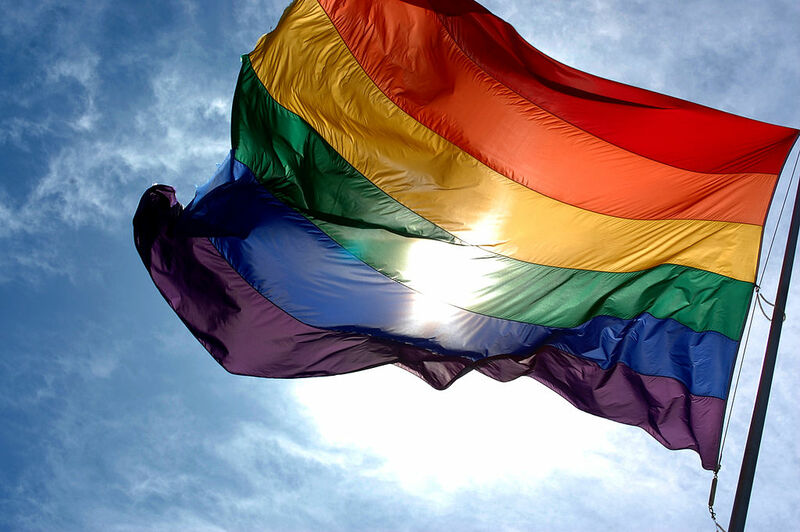 As I reported in my last newsletter, I have been campaigning for a Rainbow Crossing in the City of Adelaide and on February 3 I wrote this opinion piece on the matter for the Gay News Network. There was also a piece in the City Messenger (4 February) which referenced the costs associated with such a proposal interstate. In Sydney the crossing was positioned in Oxford Street (over a significant strip of road) and I am confident that a more cost effective solution can be found here in Adelaide. I also believe that such a project has the potential to generate new business if positioned in a neglected part of the city. 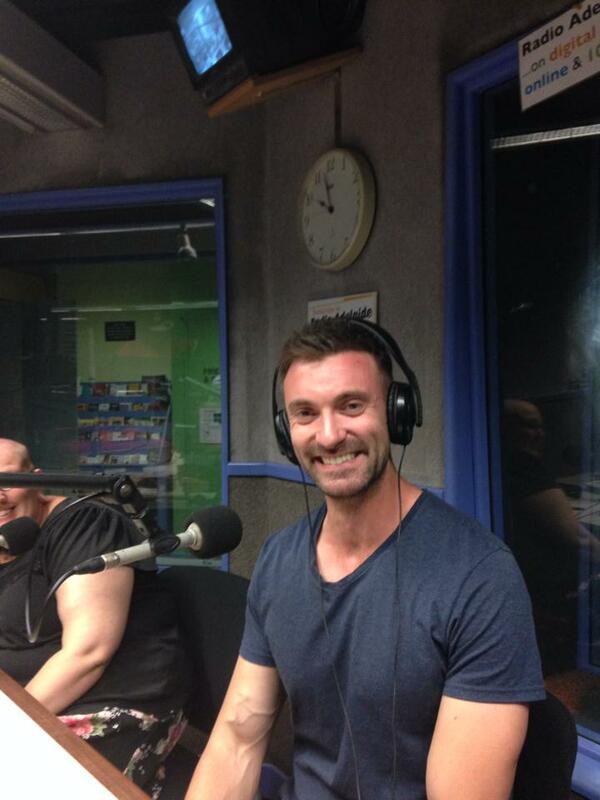 On the 5th of February I joined the Pride and Prejudice team at Radio Adelaide to discuss identity politics, the role of a councillor and the rainbow crossing idea. You can listen to the interview here. 1. Notes the successful grant application for the 2014-2015 State Bicycle Fund Projects includes funding for the installation of the following listed projects and as set out in Attachment A to Item 8 on the Agenda for the meeting of the Adelaide City Council held on the 27 January 2014. 1.1 Shared use path in Kangatilla (Park 4) that runs adjacent to Barton Terrace East between O’Connell Street and LeFevre Terrace, and forms part of the future north-south Frome Bikeway linking to Prospect Road and Braund Road BikeDirect routes ($50K). 1.2 Shared use path in Kurangga (Park 20) that runs adjacent to South Terrace between Peacock Road and Unley Road, and forms part of the shared path network linking Mike Turtur Bikeway at King William Street/South Terrace to the Frome Bikeway ($50K). Councillor Martin moved a motion to exclude Margaret Street in North Adelaide from being consulted upon within the design plan . This motion was not supported by a majority of Council, including myself. While I have visited Margaret Street and recognise that it is a narrow road, I opposed Councillor Martin’s motion as I did not wish to see the bicycle plan calved up, potentially undermining the overall strategy. Additionally, we were advised that Margaret Street will be subject to community consultation and Council will have another opportunity to revisit this. The motion was carried unanimously. This story from The City (page 7, 18, February 2015) provides some additional information on the benefits of any potential incentive scheme. I look forward to looking at Council’s report in coming months and advocating for these initiatives during the budget process. 1. Adelaide City Council provide a rebate of rates to the Ronald McDonald House accomodation building located at 270-272 Melbourne Street, North Adelaide and to the disabled cottages which form part of the complex at the rear at 99-101 Old Street, North Adelaide. This rebate should be backdated to the date of the charity’s application in May 2011. I seconded Councillor Martin’s motion on the basis that I considered it appropriate for Council to honour arrangements that had been made in the past with respect to the rebate, then consider the broader policy implications. Councillor Hender moved an amendment to the motion that it be referred to the Finance & Business Services Committee for further detailed consideration. Given the policy implications of Councillor Martin’s motion I supported this amendment. grounds of sexual orientation, gender, gender identity, or intersex status. I understand that as part of the Building Consolidation Plan it was agreed that the Women’s Changing Room would be demolished and replaced by a new facility. I supported Councillor Malani’s motion to explore the retention of the Women’s Changing Room to ensure that women in sport do not lose any important amenity as a result. 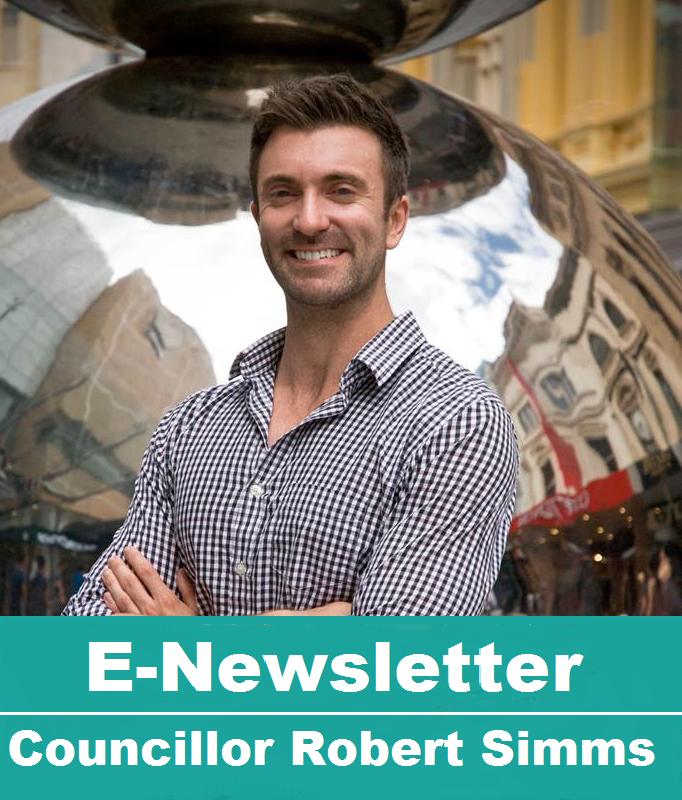 This newsletter summarises the key outcomes from the Council meeting but if you would like to read the minutes in full these are available from the Adelaide City Council website. Over the last few weeks I have attended the following community activities and events. If you have an event or activity in your neighbourhood that you would like me to attend, please do let me know.